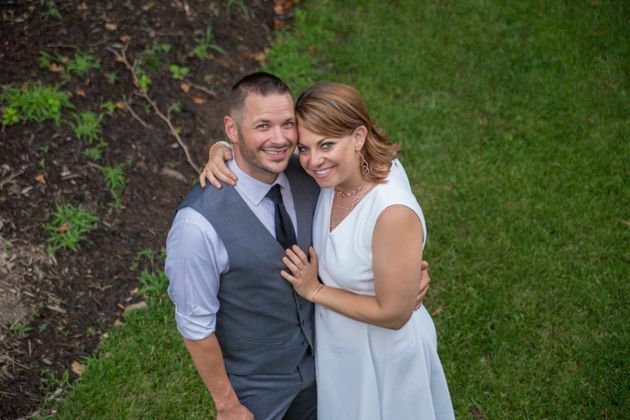 Late last month, Jenn and Lorenzo Trujillo of Leesburg, Virginia got their marriage license but had no definite plans for their wedding day. "I really just thought we would go visit the justice of the peace with a couple of friends and do it at the courthouse," said Jenn, who ― along with Lorenzo ― is a member of the U.S. Army Band. The happy couple have been together for&nbsp;two and a half years. 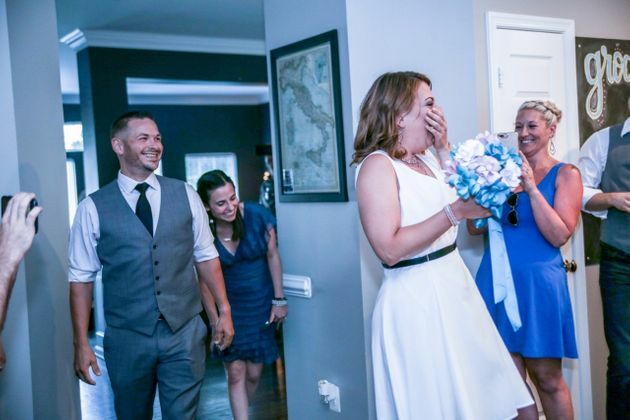 On July 7, Lorenzo pulled off the surprise of a lifetime: Under the guise of just another date night, Lorenzo threw a surprise wedding for Jenn. 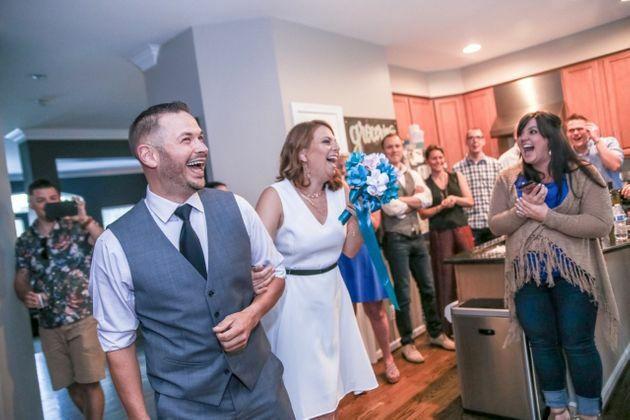 With the help of the couple's best friends and neighbors Allie and Ryan, Lorenzo pulled of "Operation Get Hitched" in just 10 days. To get things started, Lorenzo told Jenn to buy a nice dress for a fancy event he said he bought tickets to. Luckily, Jenn picked out something white so she could re-wear it at their courthouse wedding. On "date night," the couple first went to a wine bar, where Lorenzo got down on one knee and asked Jenn to marry him. Of course she said "yes," but Lorenzo was still antsy. "I was on pins and needles, because as I was about to propose, I had no control over anything back at the house," he told HuffPost. "I was so nervous that it might not work." Lorenzo quieted his nerves and told his bride-to-be he'd left their tickets for the event at Allie and Ryan's house. When they arrived at their neighbors' place, Jenn noticed some twinkly lights. Then, she spotted a photographer and Allie handed her a bouquet. "I looked at Lorenzo and said, 'Wait?! Are we really doing this right now?! How did you do this?! Is this really happening?!" she recalled. Yep, they were really doing it! 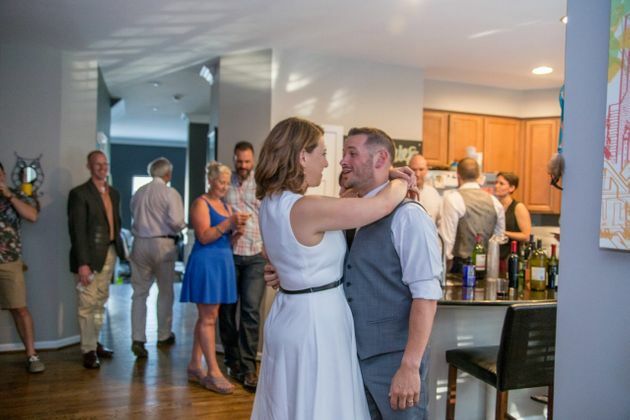 The pair were married right then and there, with 20 of their closest friends watching. Photographer Saint Elmo captured the ceremony and said he was thrilled to see Lorenzo pull off the risky plan. "My initial reaction when he told what he was going to do was, 'Oh, boy' but I was optimistic," Elmo told HuffPost. "That night, they both looked happy and ready to marry each other. Jenn is just full of fun and spontaneity so it was perfect." A week later, the newlyweds are still shocked that the plan went off without a hitch. "Everything I had envisioned came off perfectly!" Lorenzo said. "Jenn was actually surprised and didn't guess what I was up to, all our closest friends were there and it was just the perfect, intimate wedding." "Honestly, he couldn't have come up with anything better!" she said. 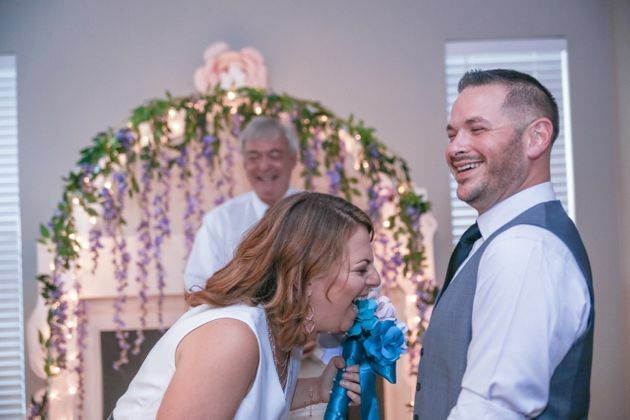 See more photos from the sweet surprise wedding below.